Leading provider of 1 hour photo printing services and expert photography advice. Create Photo Books, Custom Photo Cards and Personalized Photo Calendars Online at Ritzpix. Since 1918, Ritz Camera, has been a leading provider of 1 hour photo printing services and expert photography advice. In 2003, we launched RitzPix.com to provide our online customers with the same services and products they have trusted for almost 100 years. Create Photo Books, Custom Photo Cards and Personalized Photo Calendars Online and Pick Them Up in 1 Hour at any Ritz or Wolf Camera Location or have them Delivered. Enjoy Everyday Low Prices on Digital Photo Printing, Holiday Photo Cards, Photo Books & More. 20% off Photo Books with this coupon code. To redeem this, simply copy and paste the code when prompted at checkout! Receive free 20 page 6x6 hardcover photo book at Ritzpix, valid 6/23 only! Don't miss out! Try RitzPix.com For Free. Click Here To Get 20 Free 4x6 Prints with this coupon code. Try RitzPix.com For Free - 4 Special Offers - Free Prints, Free Enlargements, Free Photo Cards. Click Here! Try RitzPix.com For Free. Click Here To Get a Free 5x7 Folding Card. Use this code at checkout! Take 25% Off Father's Day and Graduation Folded Card Sale. Use This Promo Code at checkout! Mother's Day Sale! 25% Off All Photo Books. Show Mom you care. Order Today! Mother's Day Special: Use this coupon code at checkout to get 25% off any Photo Book at RitzPix.com including both classic and premium photo books! Save $30 on Custom 12x12 Photo Books at RitzPix.com. Order Today! Take $10 Off Custom 6x6 Photo Books at RitzPix.com. Order Today! * Your minimum order value must be $10 or more. How to save with coupon codes for RitzPix? Click one of our coupon/offer links and open ritzpix.com offer page. 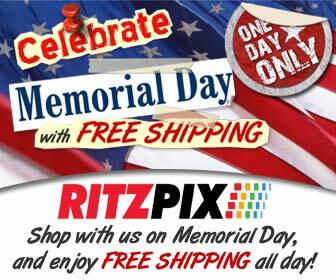 Shop the RitzPix online store. Enter the RitzPix coupon code during checkout (When available). If there is no code provided, simply follow the offer link and the discounts will be automatically applied. Found a coupon for ritzpix.com?